In today’s extremely competitive business environment, customers are more demanding than ever and will abandon a business that is too slow to respond. This has put an onus on IT to deliver solutions that provide a holistic and uniform experience to the customer, across all business channels. Microservice architecture has the potential to address this business challenge; it is all about achieving speed and safety at scale and it provides the flexibility to pick and choose technology for implementing a solution. This approach positions IT as a business partner rather than in a traditional support role. Microservice architecture consists of a suite of independently deployable, small, modular, and compassable (composable) services. Each service runs a unique process and communicates through a well-defined, lightweight mechanism to serve a business goal. It aligns with the business to deal with changes in agile fashion, matches business changes with agile response, and delivers solutions in a decentralized manner. 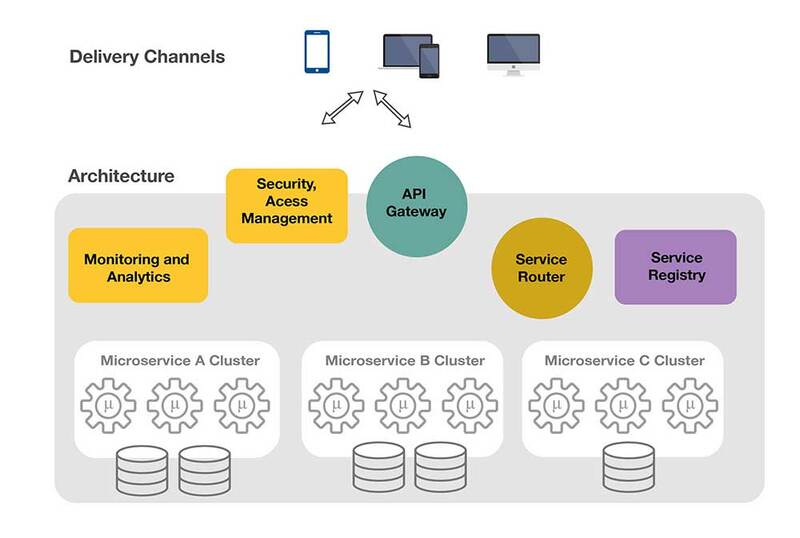 In addition to modular services, the API gateway and other elements are integral parts of microservice architecture (see figure below). 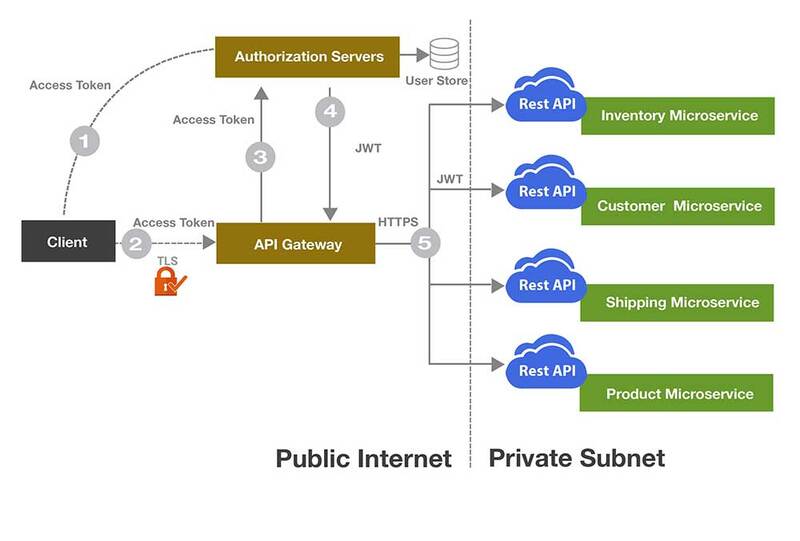 Figure 1: In addition to modular services, the API gateway and other elements are integral parts of microservice architecture. With a single-entry point into the system, it becomes easy (and manageable) to enforce runtime governance such as common security requirements, common design decisions (e.g. every consumer of the service should have X-Correlation-ID header), and real-time policies such as monitoring, auditing and measuring API usage, and throttling. An e-commerce mobile app shows product information and availability of product on the product details screen, but the desktop website version of the same e-commerce site shows recommendations, in addition to product information and availability. There are mobile apps where one understands XML payload and others understand JSON. The API Gateway is the best place to address these transformation requirements, which can be accomplished by providing application-specific APIs for the same business feature at the gateway level. A one-size-fits-all approach would make it hard to extend functionality, as the degree of diversity increases. The gateway also helps by recording data for analysis and auditing purposes, load balancing, caching, and static response handling. The diagram below shows how the gateway typically fits into the overall microservice architecture. Security is an important requirement of any enterprise solution. At a certain point in the architecture, the best options available for authentication, authorization, threat protection, message protection, etc. must be chosen. Federated identity is the preferred solution for implementing authentication and authorization in microservice architecture. Each microservice does not necessarily need to obtain and store users’ credentials in order to authenticate them. Instead, microservices can use an identity management system that is already storing a user’s identity to authenticate the user. This approach allows the decoupling of the authentication and authorization functions. It also makes it easier to centralize these two functions, to avoid a situation where every service must manage a set of credentials for every user. There are three major protocols for federated identity: OpenID, SAML, and OAuth. The figure below shows the security architecture using OAuth2.0. Every API request is authenticated at the gateway layer. On behalf of the end user, the application client first grabs an access token from the authentication server by presenting credentials. This access token is then passed along with the API request in Authorization HTTP header. The API Gateway then validates the access token with the authorization server. The JWT token, which contains the claims for the user, is then passed to backend microservices. Backend microservices then use the information inside the JWT token for authorization purpose. The same JWT token is passed along when one microservice communicates with another microservice. The flow above has the potential to be a “confused deputy problem,” as every microservice is relying on the API Gateway for authentication. Ideally, every microservice should authenticate the token as received from its caller (gateway or microservice). There is a trade-off between security and performance. The above mentioned architecture leans toward performance, as there are other mechanisms to mitigate the security risk. The microservice architecture is part of the overall IT infrastructure for an enterprise. If the enterprise IT is cloud focused, then you should use a well-known cloud based authorization server, like Azure Active Directory or AWS IAM, which can also be integrated with on premise identity stores, like active directory. An open-source server like IdentityServer4 makes it possible to implement your own authorization server and integrate with existing identity stores. Limiting the rate of requests: Maximum number of requests an API can access within a given time frame, based on rate limiting approach. Some of the approaches are Authenticated User, Request Origin, Authenticated User, and Request Origin. For example, you might decide that an API may be accessed only once a day, by an authenticated user from a specific mobile application. It is always desirable to have SSL/TLS compliant endpoints at the API Gateway, as well as at the microservices layer, to safeguard against man-in-middle attacks, and bi-directional encryption of message data to protect against tampering. If you are dealing with a number of certificates, then managing those becomes a huge administrative burden. There are solutions like letsencrypt.org, an AWS certificate manager, which makes it possible to transparently issue or revoke certificates. To strengthen security further, you should host all microservices on private subnet and whitelist the gateway IP at the microservices layer. If it is not possible to have microservices on private subnet, then you should validate each token with the authorization server per service call, however, this will impact performance. Ease in scaling is one of the key advantage of microservice architecture. You will keep adding or removing microservice instances to adapt to incoming traffic. In addition, your teams may be adding new microservices or refactoring existing microservices into multiple (especially when moving from monolith to microservices). Service instances have dynamically assigned network locations. The service registry helps to keep track of these instances. It is a database containing the network locations of the service instances. Every service instance registers itself on start-up and de-registers on shutdown. The API Gateway uses this information during service discovery. 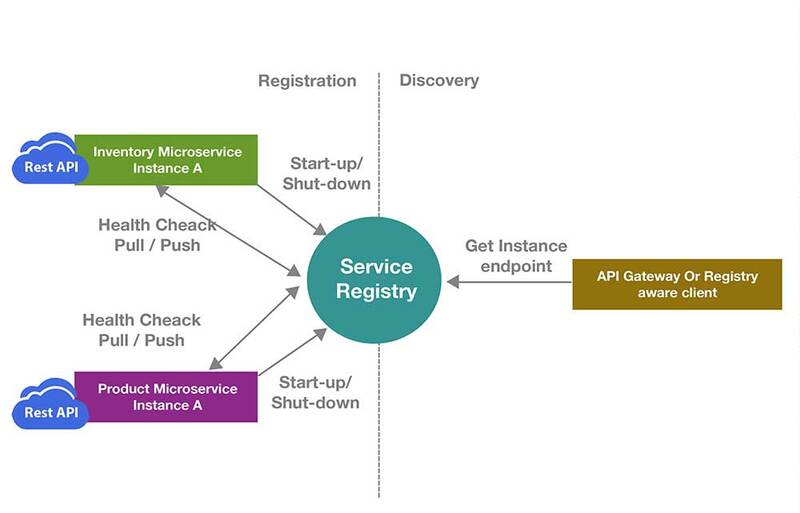 The figure below shows service registration and discovery. There are two models for checking the status of a service: pull model and push model. Although some of the registries support the pull model, it is not recommended, as it puts an additional load on the registry. Moreover, it is the service’s responsibility to update the registry about its availability/ unavailability to serve the request. As a critical component, the service registry needs to be highly available. You should plan for a cluster of registries that uses replication to maintain consistency. Never try to cache the network locations obtained from the registry at the registry user (API Gateway or registry aware client). That information eventually becomes out-of-date, causing clients to become unable to discover service instances. The number and location of service instances is dynamic. Consequently, your client code needs to use a more elaborate service discovery mechanism. 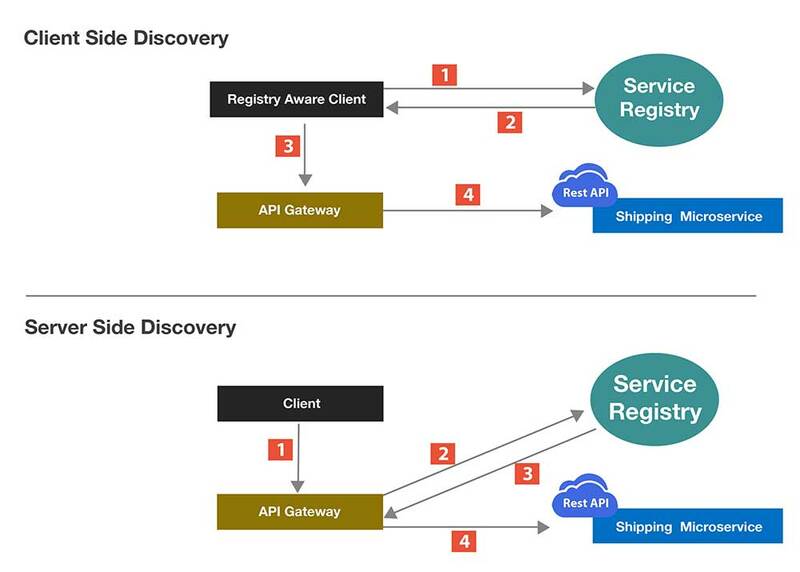 There are two main service discovery patterns: client-side discovery and server-side discovery, as shown in the figure below. It removes the discovery burden from the client so it can focus on business functions. 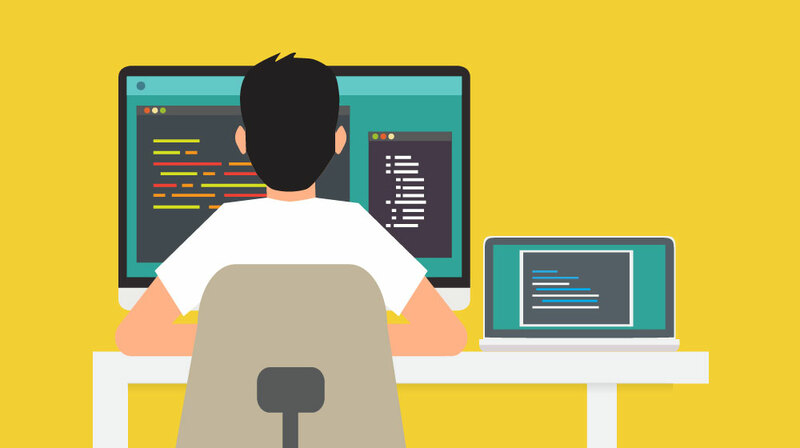 If you have multiple clients, then you need to code and maintain the discovery code for each client. It reduces number of calls over the internet. Figure 5: There are two main service discovery patterns: client-side discovery and server-side discovery. It is often necessary to orchestrate across multiple fine-grained microservices to accomplish a business use case. 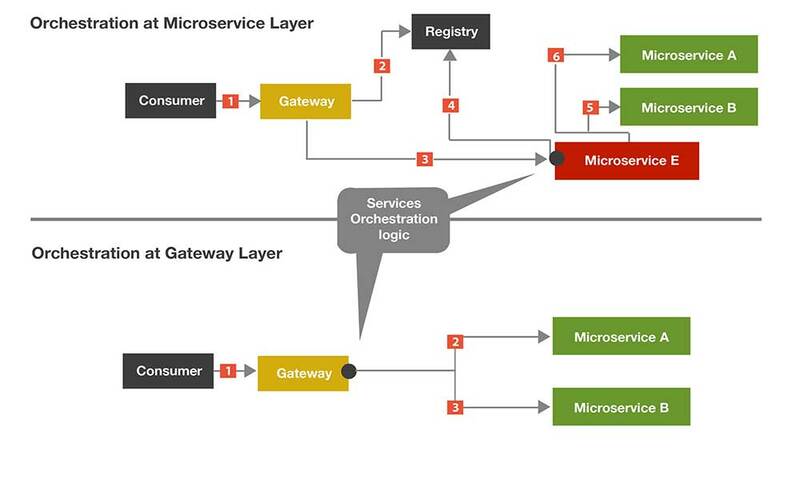 As shown in the figure below, there are two options for implementing the orchestration: using the API Gateway as the orchestration layer or coding orchestration in a separate microservice. You should avoid orchestration at the gateway layer. It violates the single responsibility principle and, in the case of scaling the API, you will have to scale the gateway along with orchestrated microservices. Some of the API Gateways have little to no capability for orchestration. Although it is discouraged to use orchestration at the gateway layer, if you still want to use it for whatever reason, then there should not be any business logic involved while orchestrating. Often microservices have to deal with different clients on the front end. They have different needs, from both protocol (SOAP, REST, JSON,and XML) and data perspective. Similarly, when you are moving from monolith to microservices, backend services may understand different protocols (SOAP, REST, AMQP etc.). Develop your transformation adapters as reusable components. Also, do not try to code all different clients’ needs in a single API. You should think of creating client-specific APIs with pluggable transformation logic. Figure 6: There are two options for implementing orchestration: using the API Gateway as the orchestration layer or coding orchestration in a separate microservice. Being a single entry point into the system, all of the traffic in and out of the system passes through the API Gateway, so monitoring the gateway is critical. This provides an opportunity to capture the information about data flow, which becomes an input for IT administration and IT policies. You should also regularly analyze the traffic over long range period to be able to identify predictable traffic levels and be ready for any surge. Traffic and data analysis helps in understanding/estimating the load on the system. In turn, this helps in scaling the gateway and underlying services accordingly. The gateway can scale both horizontally and vertically. An API Gateway being load balanced runs the same configuration to virtualize the same APIs, and executes the same policies. 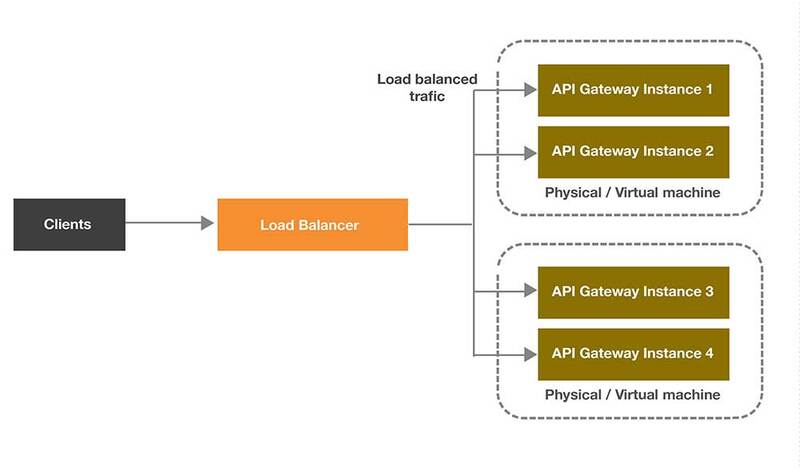 If multiple API Gateway groups are deployed, load balancing should be across groups. The API Gateway does not impose any special requirements on load balancers. Loads are balanced on a number of characteristics including the response time or system load. The execution of API Gateway policies is stateless, and the route through which a message takes on a particular system has no bearing on its processing. Some items like caches and counters, which are held on a distributed cache, are updated on a per-message basis. This helps the API Gateway to operate successfully in both sticky and non-sticky modes. The distributed state poses a certain restriction in terms of active/active and active/passive clustering. For example, in case the counter and cache state is important, the system should be designed to make sure at least one API Gateway is active at all times. This means that for a resilient high-availability system, you should employ a minimum of at least two active API gateways at any given time, extra in passive mode. The API Gateway also ensures zero downtime by implementing configuration deployment in a rolling fashion. This means, while each API Gateway instance in the cluster or group takes a few seconds to update its configuration, it stops serving new requests, but all existing in-flight requests are honored. Meanwhile, the rest of the cluster or group can still receive new requests. The load balancer ensures that requests are pushed to the nodes that are still receiving requests. Being a critical component and ONLY entry point in microservice architecture, you should deploy the API gateway in High Availability (HA) mode. API Gateway instances are usually deployed behind standard load balancers, which periodically query the state of the API Gateway. If a problem occurs, the load balancer redirects traffic to the hot stand-by instance. Events/ alerts are configured for getting notifications in case any issue occurs. If an event or alert is triggered, the issue can be identified using API Gateway analytics and the active API Gateway can then be repaired. API Gateway instances are stateless by nature. No session data is created, and therefore there is no need to replicate the session state across API Gateways. However, API Gateways can maintain cached data, which can be replicated using a peer-to-peer relationship, across a cluster of API Gateways. Proper traffic analysis, to limit traffic to backend services, to protect against message flooding. This is particularly important with legacy systems that have been recently service-enabled. Legacy systems may not have been designed for the traffic patterns to which they are now subjected. Monitor the network infrastructure carefully, to identify any issues early on. You can do this using API Gateway Manager and API Gateway Analytics. Interfaces are also provided to standard monitoring tools, such as syslog and Simple Network Management Protocol (SNMP). As the number of APIs keep on increasing, it is essential to establish policies and monitoring. The policies can broadly be categorized as design-time governance and runtime governance. The policies are highly influenced by IT (business) objectives and goals.